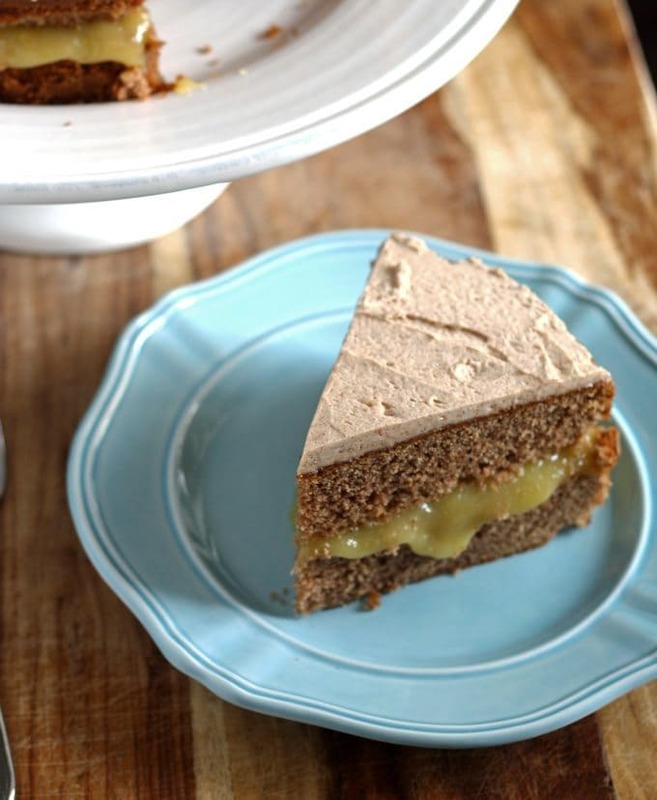 This spice cake has an apple curd filling and is topped with cinnamon marscapone frosting. It is perfect for fall and Thanksgiving – just the right amount of sweetness paired with just the right amount of spice. This is the very first cake recipe I am sharing on this blog, and I’m super excited about it. If you couldn’t tell. I have been waiting to post a cake because, honestly, I hadn’t made many before and I needed to do some practice. I made a cake a few years ago for my mom’s birthday and it was the saddest cake I had ever seen. It tasted dry too. So I decided to practice a little bit, read some cake tips and wait until I felt I was ready. If you want to feel “ready” too, here are some of the sources I read when I started all of this baking cake madness. And to be honest, I should have put the apple curd in an entirely seperate recipe because it is fantastic. If you have never made curd before, don’t be afraid – its easier than it sounds. The hardest part, for me, is getting it to be think enough. I found a great fix for that though: if your curd is too thin, put it into a mason jar, seal it and put it in the freezer for an hour. Yes, while it is HOT. Then take it out of the freezer when your hour is up and in the refrigerator it goes. Prepare the Apple Curd 1 day before you plan on frosting the cake. In a saucepan over medium, combine the apples, water and lemon juice. Bring to a simmer and cook for 45 minutes, or until the apples are soft. Remove from heat. Using a hand blender, puree the apples and push them through a fine mesh strainer into a clean saucepan. Add the sugar, eggs, butter and ginger to the apples and cook over low heat until the mixture thickens. The temperature should be just below a boil. Transfer to a jar, cover immediately and put in the refrigerator. Preheat oven to 350 degrees F. Butter and flour 2 10-inch round cake pans. In a small mixing bowl combine the cake flour, baking powder, baking soda, cinnamon, allspice, nutmeg and ginger with a whisk. In a mixing bowl, cream together the butter, sugar and salt until light and fluffy. Beat in the eggs, 1 at a time, beating well. Add the dry ingredients and the buttermilk alternately beginning and ending with the dry. When the batter is well mixed and smooth, divide it the cake pans. Bake for about 35 minutes or until a toothpick inserted into the center of the cakes come out clean. Let cool in the pan and then turn out to cool completely on a cooling rack. In a mixing bowl, whip the cream until peaks form. Then add the marscapone, sugar and cinnamon Whisk together until combined. If the cake layers have domed during the baking process, slice off the tops so they are flat and even. 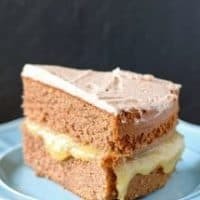 Place one cake layer on a cake round or plate. Then pour the apple curd over the cake evenly. 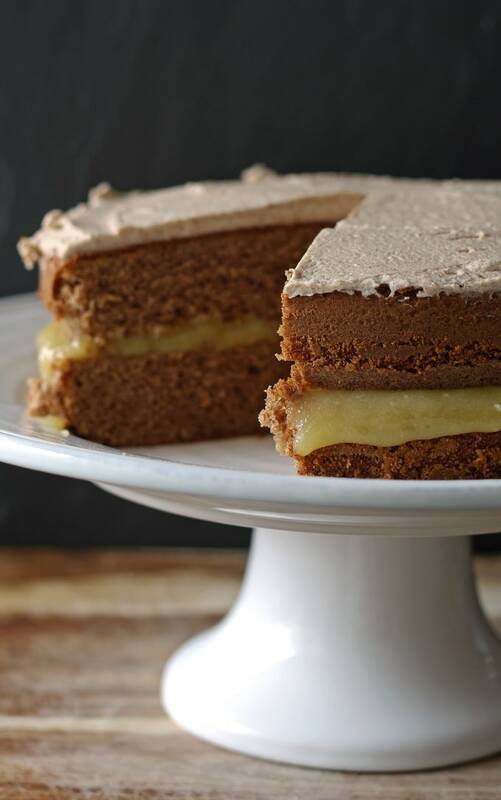 Place the second cake layer on top of the apple curd. Then frost the top and sides of the cake with the cinnamon marscapone frosting. 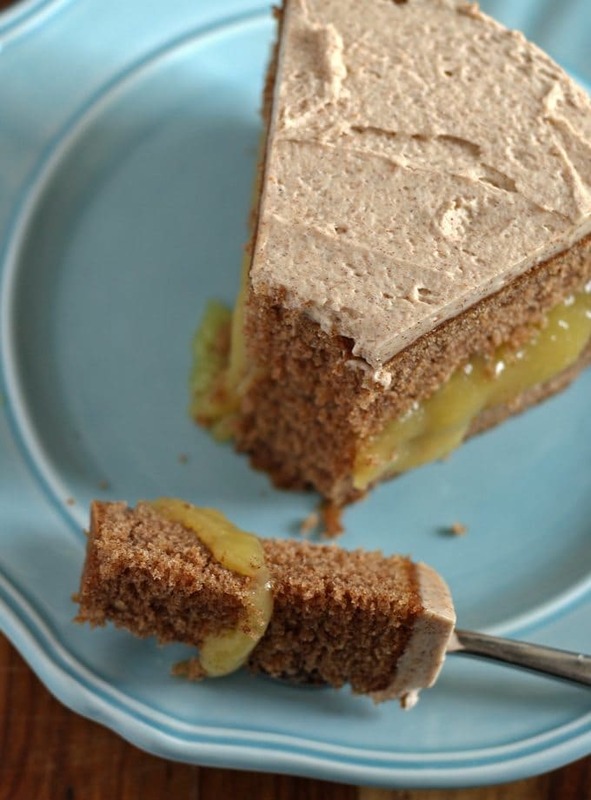 Cake recipe adapted from [Food Network.br]Apple Curd recipe adapted from [Allrecipes. Oh my gosh, I’m getting hungry just looking at this. And, I’ve never even tasted spice cake before. Every recipe that you post always sounds delicious! That looks so very good. I pinned! Thanks for sharing. I saw that picture and looked no further. That looks heavenly. I will make it for Thanksgiving. looks divine! 🙂 well done! This is something want to try out. Just the name of it makes me hungry! I’ve never heard of apple curd. This cake looks amazing, you did a great job. 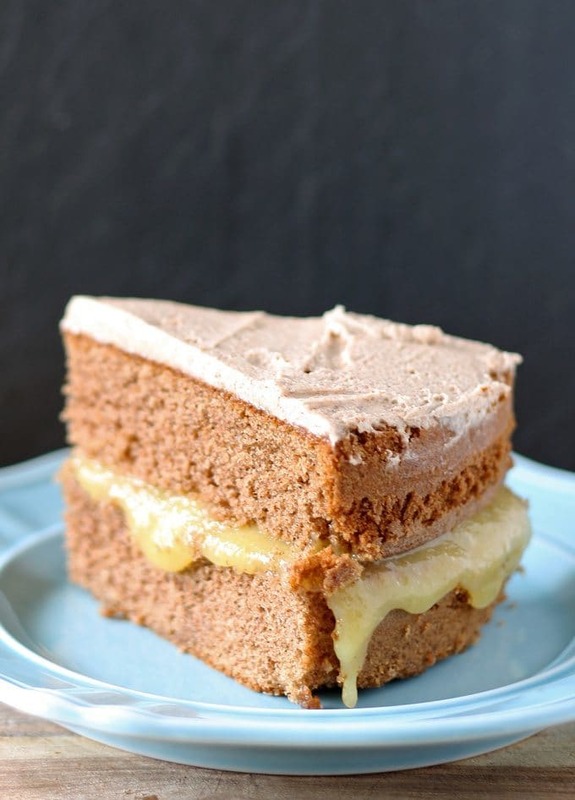 Wow, the first cake recipe on your blog – and it looks and sounds like a good one! never tried it before or seen anything similar! Hi Jenny! Thank you for much from stopping by and visiting. It’s always fun to meet new bloggers. You have a beautiful site, and this cake looks gorgeous!! Mmmm this is my kind of dessert…I just love the holidays!